Spot silver moved higher yesterday, ending the silver trading session with a wide spread up candle, which closed marginally above the high of Wednesday, and just below the 9 day moving average. 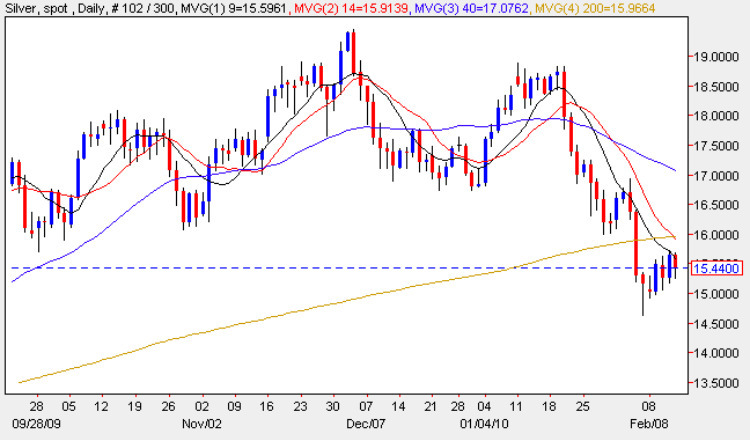 However, despite this attempt to recover some of the losses of the last few weeks, the daily silver chart remains firmly bearish at present, a view reinforced by the high of yesterday which failed to breach the 9 day moving average, and which now presents a technical resistance area to any further move higher. In addition, and to add further to this bearish view, the 14 day moving average is now breaking below the 200 day moving average, adding a bear cross signal to the mix of negative sentiment. Furthermore we have deep and sustained resistance above in the $16 per ounce to $18.50 per ounce region, and for any longer term recovery in silver prices, we will need to see this level breached for any longer term upwards momentum to be maintained. In the short term we may see the silver price continue to move higher following the hammer signal of Friday last week, but in a relatively weak way with $16.25 per ounce being the first target on the horizon.